I should really start this review by saying that Forgettable is anything but. It’s a cheap and clichéd line, but I wanted to get it out of the way as soon as possible. Sorry, let’s move past it. Chances are you’ll already be familiar with a few of the members that make up Sorority Noise, and if you aren’t then you’re missing out. Featuring Cameron Boucher of Old Gray and numerous other projects alongside Kevin O’Donnell and Jason Rule of Two Humans, Forgettable is another excellent release to add to each of their respective discographies, with the addition of Adam Ackerman on guitar. Mixing garage upbeat instrumentation with personal lyrics Sorority Noise’s debut falls somewhere between emo and punk, taking the poetic lyrical styling’s of the former and seamlessly blending them with the energy of the latter. Sorority Noise take elements from each of their individual projects and channel it into their debut LP. The songs here are cathartic yet catchy, and Forgettable serves up hook laden down-and-almost-out anthems song after song, starting with Rory Shield. The records opener explodes after a brief bass intro into a fuzzy bed of noise the likes of which make up the majority of Forgettable. Dense and intricate soundscapes are the order of the day, and it’s one of the many areas in which Sorority Noise excel, as songs frequently peak before nosediving, bouncing back faster and bolder, as is the case on the opener, which relents slightly during the second verse before calls of ‘Tell me again that you don’t wanna break my heart / and I’ll tell you again that it’s already broken’ during a suitably large chorus. The track ends with Old Gray styled screams over soaring instrumentation, leading to a frantic final thirty seconds. Mediocre At Best follows and settles for a jauntier style as toe-tapping bass guitars creep, matching the deeper vocals of Rule, whose expressions of mild self-loathing (‘Nobody likes me and that’s all I hear / I spent a lot of time last year learning that I don’t like me too’) contrast the charismatic bounce of the instrumentation he contributes to. This balance between light and dark is partly what makes Forgettable so damn memorable, and it’s a trend that features heavily. Sorority Noise are all members of the self-depreciation society but their music possesses an uplifting spirit to it, with songs having a certain spring in their step whilst straying into darker territory. The grungy Blonde Hair, Black Lungs is a solid example, pairing lines like ‘I drove home at a hundred miles an hour just to see what it felt like to fly / And I crashed my car into someone’s front yard to see what it feels like to die’ with stomping, fist in the air instrumentals. Still Shrill features weaving, melodic guitars in the vein of more traditional emo, whilst Nick Kwas Christmas Party begins with mellow acoustics before writhing once it picks up, making use of dual vocals over crashing drums and ending with excellent, scaling guitars. 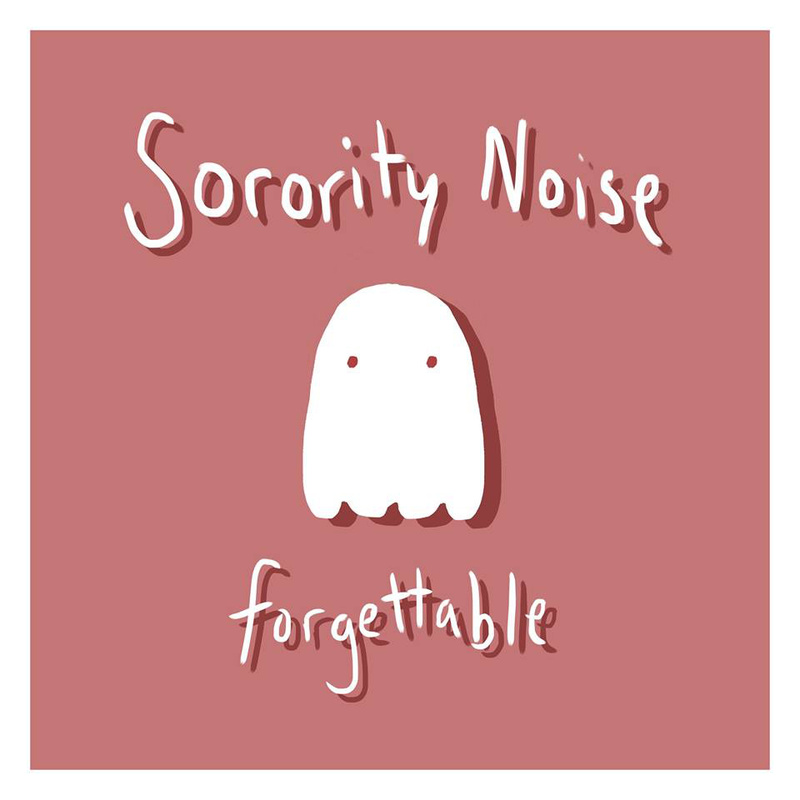 Forgettable isn’t lacking in creativity, and the four members of Sorority Noise throw their all into their music from the offset. Lyrically the record is excellent, most noticeably on Dirty Ickes which features lines like ‘And I taught myself French to tell you I love you in ways you could never understand’ as the tracks swells and unfurls, building to cascades of warm, comforting noise. The record ends with its two most sentimental selections in Smooth Jazz and Smoke and they’re arguably the best songs that Forgettable features, with each striking a chord with a listener in a notably different way to the songs that precede them. Both bring in the violins of Nick Kwas, and if you’re familiar with Old Gray’s music then you’ll likely recognise him and the goosebumps that normally accompany his playing. There’s nothing Christmas party-like about the echoing, acoustic Smooth Jazz, which is haunting as Boucher laments ‘Am I invisible now, to a friend in a hospital gown?’ The song blooms courtesy of its violins and delicate nature, and it’s a moving tribute to the friend addressed which sees Sorority Noise opt for a stripped back approach and make full use of it. Smoke begins with a similarly sombre opening but picks up and adds layer as it develops, climbing gradually to an empathic and emotional crescendo which sounds huge given how the track started. As Boucher sings ‘Sleep next to me, tell me everything is how it should be’ as Forgettable fades to a close the curtains draw on a record that doesn’t hold back and sounds all the better because of it. Forgettable comes in at around 21 and a half minutes, meaning that although it’ll be up there with the best you’ll hear this year it’ll likely be one of the shortest you’ll hear as well. Its runtime does hold it back slightly, and if you’ve been a fan of the band since its formation you’ll also find a few already familiar songs, with four being taken from past releases and tweaked for the better. It’s a small criticism considering the quality of the tracks that make up Forgettable, but maybe the release is slightly disappointing in this regard. The 2014 versions are much more polished production-wise and they sound much better, cleaner in a sense, and given that they were pretty damn excellent to begin with each is a big improvement. With Forgettable you get a record which is somewhat short yet subtly sweet. Instead of allowing its claustrophobic musings to weigh the songs down Forgettable embraces its troubled creators and lifts them up. Even when contemplating car crashes there’s an irresistible underlying charm that encourages a suicidal sing-along of sorts. It’s an odd quality to articulate with words, and if I could write as well as Sorority Noise do here I suspect it wouldn’t be a problem, but there’s a bleak sort of euphoria to Forgettable which is bursting at the seams, begging to affect you if only you’d give it the opportunity to both emotionally and physically move you. I’d say that makes Forgettable more than worth your time, and despite its few flaws (which are only flaws depending on your preference / familiarity) I wholly recommend letting Forgettable in. It’s almost like you can see in your mind what you’re going to do with the nunchaku five or six or even twenty steps further along, but you know all this without knowing. If you or your child(ren) are considering signing up for martial arts classes, here’s a brief overview of the types of equipment that you may need to purchase for training.